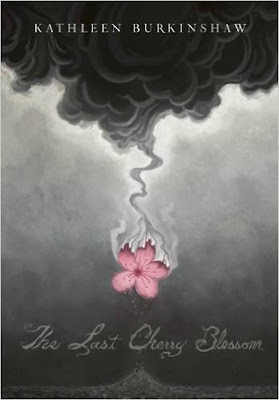 In my last post you read the backstory about Kathleen Burkinshaw's middle grade book, The Last Cherry Blossom. Now, here's the review...but be warned, I'm including a spoiler alert! With that foreboding introduction, the reader is propelled into Yuriko's world in 1944. Before Yuriko leaves school in this opening scene of The Last Cherry Blossom, she asks her teacher for her grade on her ancestral project she just completed. Yuriko is proud her lineage traces back to samurai warriors in the 1600's. Against the backdrop of her anxiety over the air raid drills, Yuriko does not receive the praise she anticipates. Instead her teacher says, "That is not right." She leaves without telling Yuriko what's wrong with her paper. That question, as well as the appearance of a friendly yet sad stranger, are mysteries snaking through this novel which will appeal to both girl and boy readers. Yuriko's "normal" is living with her beloved Papa, her Aunt Kimiko (who she doesn't particularly like) and her pesky, younger cousin Genji, and sharing secrets with her best friend, Machiko. As a member of the upper class she is protected, loved, educated, and the recipient of luxuries like custom-made silk kimonos for the annual cherry blossom festival. Her life begins to change when her widowed father decides to remarry. At the same ceremony Kimiko remarries a man named Akira-san and suddenly the house holds two families instead of one. When an acquaintance alludes to a man named Nishimoto-san who would have loved to see her, Yuriko learns who her true parents are. Like being hit by a bomb, Yurko begins to experience excruciating repercussions in her identity, family, and home life. Burkinshaw's use of lines from newspapers, posters, and radio shows at the beginning of each chapter effectively sets the story within its' historical and political context. The next chapter after Yuriko hears her devastating news is sub-titled, "No matter what sort of air raid comes, the neighborhood association will be safe." Since we know what happened at Hiroshima, the neighborhood association's words foreshadow more bad news for Yuriko. 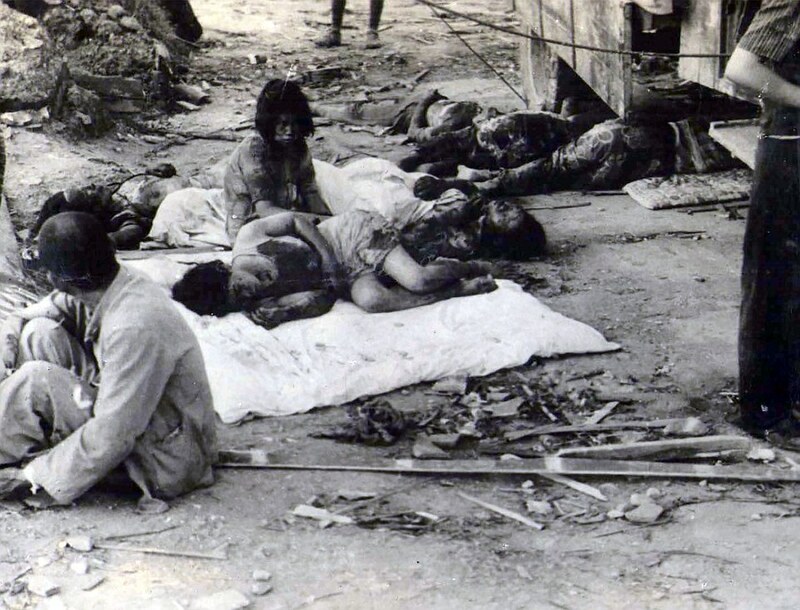 Right after Tokyo is bombed, Yuriko walks into a conversation between Akira-san and her papa. "Do you really think they will bomb our city?" I asked, a quaver to my voice. "Anything is possible in war." As Papa said this my stomach swarmed with butterflies. I ran to him and welcomed his embrace. "Papa, are we all going to be all right?" I squeezed tighter. I swear all one hundred million hearts from the radio slogan were beating in my chest. Will fire be raining down on us soon? Maybe we should just live in the bomb shelters? But how is that really living? He hugged me close and then stepped back. He looked at me and said, "I will keep you safe." Akira-san added, "Our family's safety is our main concern." He glanced at Papa. "But now you should get ready for bed. It is late." I nodded and gave him a hug as well. When I got to the door, I turned and asked, "Papa, do you think we will have school tomorrow?" The Last Cherry Blossom reflects the mixture of cultures present in Japan during World War II. Yuriko's father loves The Three Stooges movies and she and Machiko listen to American jazz. At the same time, the emperor is considered divine and suicide is an honorable option if one falls into enemy hands. 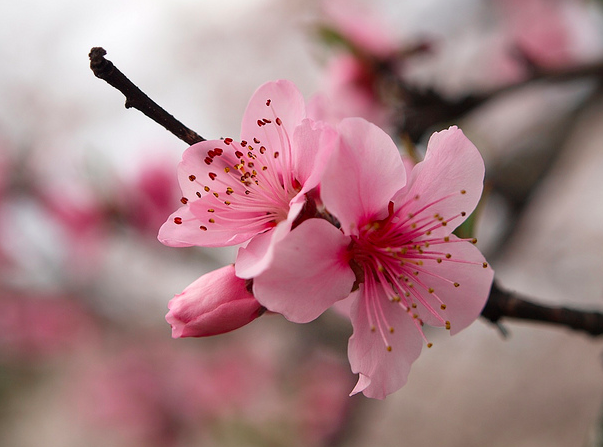 There are many lovely references to cherry blossoms which tie the book together. 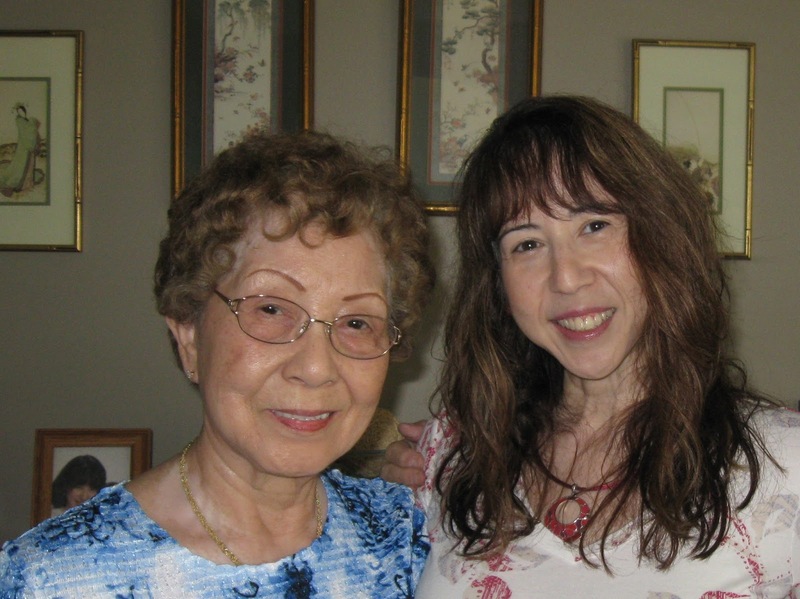 After attending the annual cherry blossom festival and singing and dancing, Yuriko returns home to a family celebration. Sadly, a few months later, the atomic bomb destroys Yuriko's world. To win my ARC, please leave me a comment by July 28. If you are new to my blog, make sure you leave your email address. 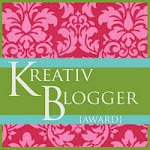 AND if you decide to start following the blog, let me know and I'll enter your name twice. You can enter again even if you entered last week. Don't worry- I'm keeping track of the growing list of entries! If random.org doesn't choose your name, you'll have another chance to win The Last Cherry Blossom in September. Joyce Hostetter and I will be giving away a copy through our next issue of Talking Story on "Radiation: Friend or Foe". And if all else fails, of course you can buy one here! As many of you know, I love sharing my fellow writers' good news. 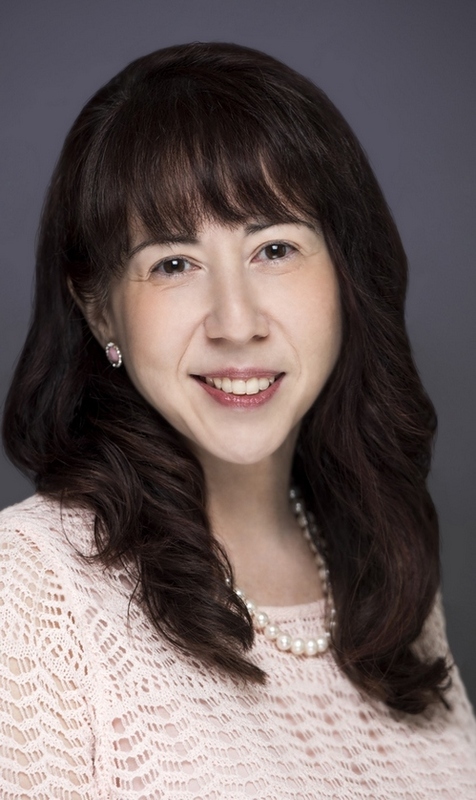 Here is an interview with Kathleen Burkinshaw, author of the debut middle grade historical novel, The Last Cherry Blossom. Next week I will post my review. I hope this will get your interest aroused and you'll leave a comment to win my ARC! CAROL: I understand that you grew up hearing your mother’s stories about Hiroshima. How much of The Last Cherry Blosoom was fact and how much was fiction? KATHLEEN: I used quite a bit from my mother’s life. Some of the ‘fiction’ was the order and timeframe. The events in her life did not happen all in one year like Yuriko’s in the book. The facts I used included: my mother came from a wealthy family with Samurai ancestry, and her Papa did own his own newspaper business. Her Aunt and cousin moved into her home prior to the double wedding. 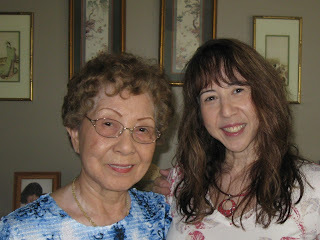 My mother lived on the same street as her friend Machiko and they enjoyed listening to jazz music together. CAROL: What did your research entail? KATHLEEN: I spent many, many, many hours reading books written about how WWII affected the people in Japan. There were some books that had diaries of older people during the years that Japan was at war. Japan had been at war since 1937 with China. So by the time that Japan bombed Pearl Harbor, the Japanese people had already been at war for four long years. By reading these accounts, I was able to get a better understanding of how the Japanese viewed their Emperor and the lengths some would go to support him. 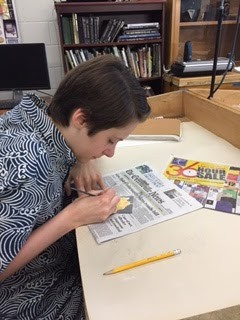 I researched newspaper headlines, radio show slogans, and propaganda poster copy. Of course my mother gave her account of her experience on August 6th. I also read books about other survivors of Hiroshima and Nagasaki as well. My intentions when I wrote this book and when I do my presentations are to keep it nonpolitical. We visited the Hiroshima Peace Museum last year. 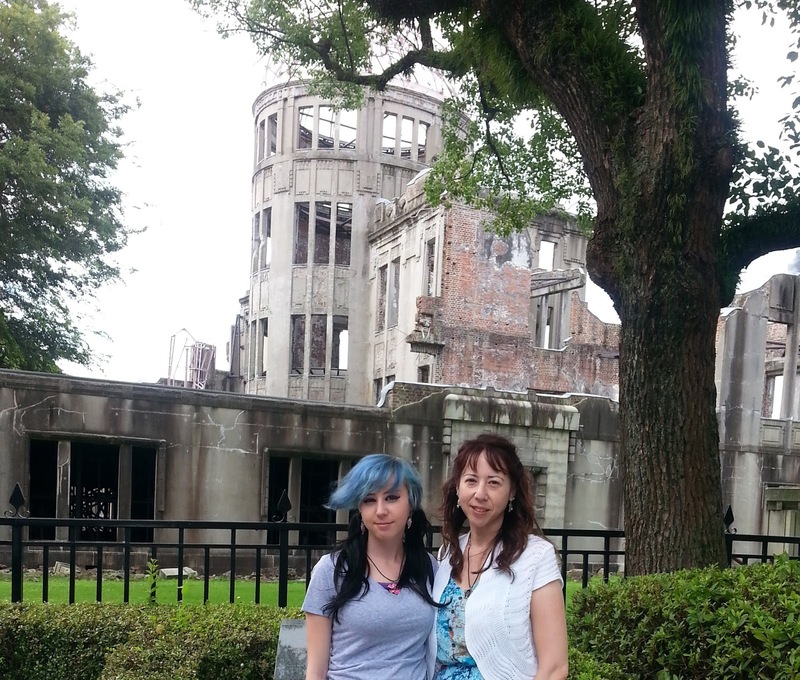 We also honored my mother at the Hiroshima National Peace Memorial Hall for Atomic bomb victims. The people in the library were so kind. They spent two hours with me and helped me find on a map where my mom lived. That was when I realized that she was much closer to the epicenter than she had remembered. She was only 2 miles away. A miracle that she survived. I also researched effects of radiation from that blast, as well as the different type of damage and burns caused by an atomic bomb vs. a regular bombshell. 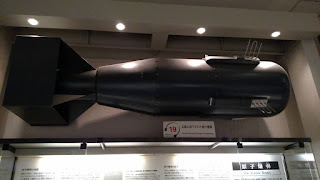 The main fact that I learned which always leaves an impression on the middle school students: a comparison between the number of tons of TNT the bomb dropped on Hiroshima (15 thousand tons of TNT) that caused all the damage I show them on my slides to the largest of the warheads America now has (2.5 MILLION tons of TNT)!! CAROL What was your mother’s reaction to the story? KATHLEEN: My mother read my first draft, so she had me change words that were not accurate or settings that needed tweaking. She read the final draft of the manuscript that my agent used for submission to publishers. She loved it, probably because I was her daughter. But the one thing that amazed me – her first reaction to hearing it would be published--she couldn’t believe that people would really want to read about her and her Papa. That deeply touched her. CAROL: You used a lot of Japanese words in the text. Was it difficult to decide which to use? KATHLEEN: I really wanted to stay true to the culture and the way they spoke during that timeframe. My editor supported me with that. I initially was going to write it with an explanation of the word later in the sentence, but that could be cumbersome. My editor suggested the glossary. CAROL: How did you know where to begin your story? KATHLEEN: That stumped me in the beginning. Originally I had too much info dump and flashbacks, which did not work well. That’s when I had to throw the actual timing of events away and start fresh with lining up events in a one-year time span. It took a lot of sticky notes and blank paper to re-arrange the time line. CAROL: How did you decide to write it in first POV? KATHLEEN: I was on the fence until I read BLUE by Joyce Moyer Hostetter, which was in first person. As the reader, I felt closer to the character’s emotions. The more I thought of it, I felt it would touch my readers more if they witnessed the horror through the main character’s eyes. Originally my agent wanted me to write it in 3rd person. I really want to keep it in first. But I rewrote the crucial scenes on the day of the bombing in 3rd person and submitted that to her. She agreed first person would be best. I was very happy and relieved. After reading excerpts from THE LAST CHERRY BLOSSOM many students feel they are “there in that moment”. It is something a few paragraphs in a textbook does not give them. CAROL: Can you tell us a little about your path to publication? KATHLEEN: I found my wonderful agent, Anna Olswanger, through a written critique at the 2012 SCBWI Carolina’s fall conference. I didn’t get an offer of representation at that time though. I continued to work on the manuscript with her comments and suggestions. When I felt it was ready, I emailed Anna around January 2013 and asked if she would look at my revisions. She had me do several rewrites. 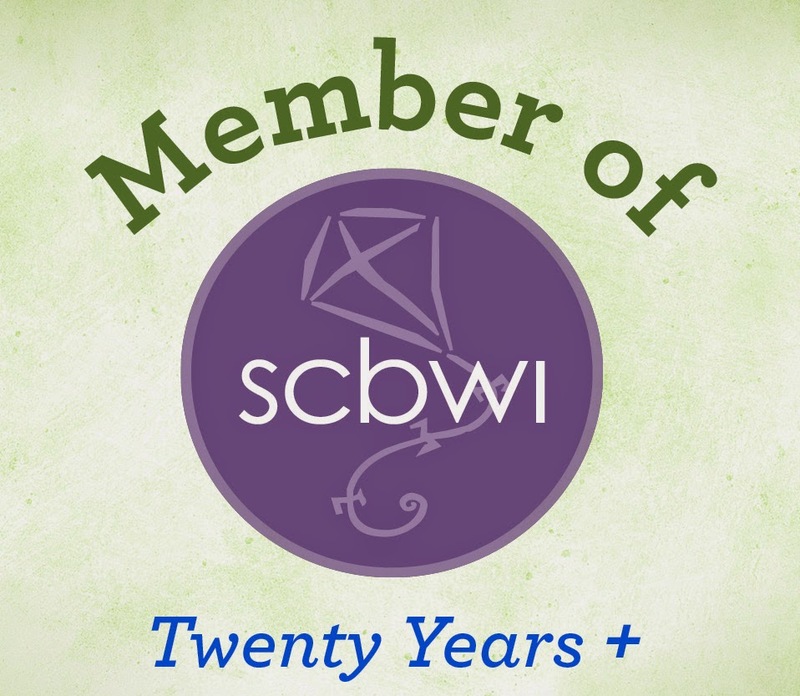 I submitted my revised 10 pages to the SCBWI Carolina’s Writing Contest in 2013 and won first place! Just before the 2013 SCBWI fall conference, she offered representation.We did one more round of revisions before she submitted my manuscript to publishing houses in November of 2013. I received the offer and contract from Sky Pony Press in November 2014! Once revisions began with Sky Pony, one of the issues we worked on was how to show the “polite” conversation that adults had with other adults and children without it sounding stilted. 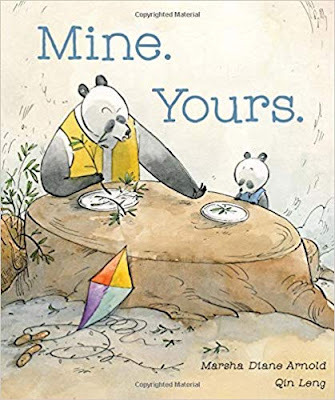 An author who writes wonderful MG and YA books set in Japan suggested using contractions when the young people talked with each other to make it more informal. Thank you so much for interviewing me, Carol. I’ve been reading your wonderful reviews and interviews with authors and I’m so excited to finally be one of them! Kathleen Burkinshaw resides in Charlotte, NC. She’s a wife, mom, and owns a dog who is a kitchen ninja. For the past six years, she has visited middle schools to discuss her mother’s life in Hiroshima during the last year of WWII and her experience when the atomic bomb dropped on August 6th. During this time, she wrote her debut Middle Grade historical fiction, THE LAST CHERRY BLOSSOM (Sky Pony Press August 2016). She has carried her mother’s story her whole life and feels privileged to now share it with the world. I will be giving away my THE LAST CHERRY BLOSSOM arc on July 28th. Leave me a comment on this post and I'll add your name to the list. If you're new to my blog, please include your email address. Leave me a comment on both posts, and you'll be entered twice! And if you don't win, you can order a copy here. Every once awhile I come across a book that I can't bear to give away. I'm sorry friends, but Carver by Marilyn Nelson, (Boyds Mills Press, 2001) is a book that is staying on my shelf. Like me, many of you probably know some of the basics about George Washington Carver's life. You may know he was born a slave in Missouri about 1864, started the agricultural department at Tuskegee Institute, and developed new uses for peanuts, cowpeas, and sweet potatoes in his desire to help poor farmers combat poverty. 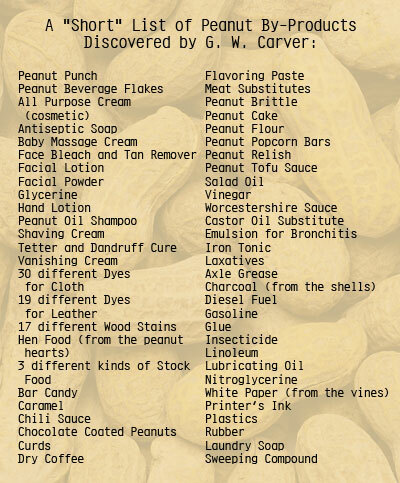 But what you probably don't know is that besides being a scientist, inventor, and botanist; he loved to sew, paint, play piano, and read his Bible. 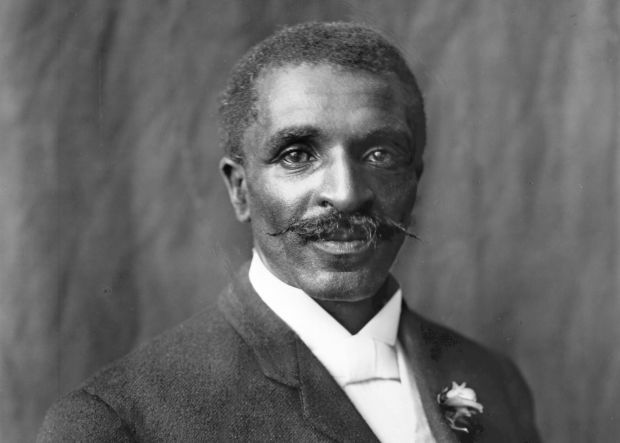 Although he never married or had children, for 47 years at Tuskegee he taught multitudes of students, personally corresponded with countless farmers who sought his help, and left a legacy of information and inspiration. Award winning author Marilyn Nelson, tells Carver's story through beautiful poetry. Sometimes the poems are from Carver's point of view and his emotions and thoughts are so well portrayed that you feel as if you are inside his skin. Other poems are written from the point of view of people who interacted with him. All of them weave together well-researched details and build a narrative of Carver's life. Here are a few of my favorites, but please note that I had difficulty formatting the second, third and fourth poems and had to skip lines. There are no line spaces in the original. tissue of mist between trees. like twilight fireflies, like stars. casting ten thousand questions into the future. and we were meeting early to practice. He'd never seen this species before. for me, that I get rid of my littleness. I read this book because I thought Carver could be an inspiration for Lillie, my African American character in Half-Truths. What I didn't expect, is how much Nelson's poetry and Carver's life would inspire me. 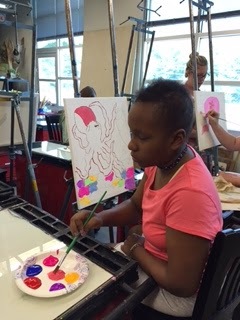 It's been a pleasure to share images from my week volunteering with Explore the Arts camp at the Fine Arts Center in Greenville, SC. If you missed it, here are the first and second posts. Thanks to all who have left comments and vicariously enjoyed my week. Apart from talented instructors, one of the things that amazed me was the venue for this camp: the Fine Arts Center itself. 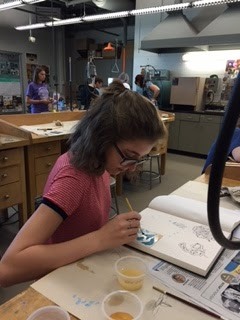 It was like attending camp in a museum with one major difference: instead of entering gallery rooms off the halls filled with glass, pottery, exotic quilts, and lithographs, students walked into fully equipped art classrooms and studios. The creative writing instructor, Laura Gerhiser Hensel, is my new friend who suggested I volunteer at the camp. 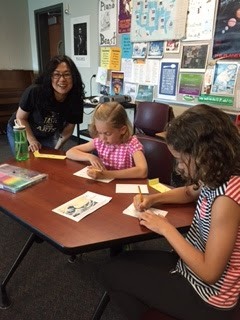 During her class, upper elementary and middle school students focused on the basics of figurative language and incorporating the five senses into various writing exercises. 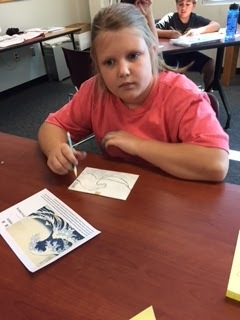 Writing both poetry and prose, students invented new words, played with phrases, and explored synesthesia. And marathons of Saturday morning cartoons. I remember wondering if I could ever draw that well. Syrup, thick and slow, sliding off the counter and perfectly into the bag on the floor. pages and pages vanquished by sugary goodness. A true killer. I remember yellow humanoid bunnies and tuxedo-wearing demons and alien cats named Fifi. Being excited for my first commission. I ran upstairs after dinner. And drew and redrew every painful frame. I decided enough was enough, and I pressed into the paper a little too hard. I remember the explosion, the ink everywhere, and the fun I had, letting the crazy take over. I remember waking up on the floor too early, only to edit the frames together. Triumphantly, I released the animation. 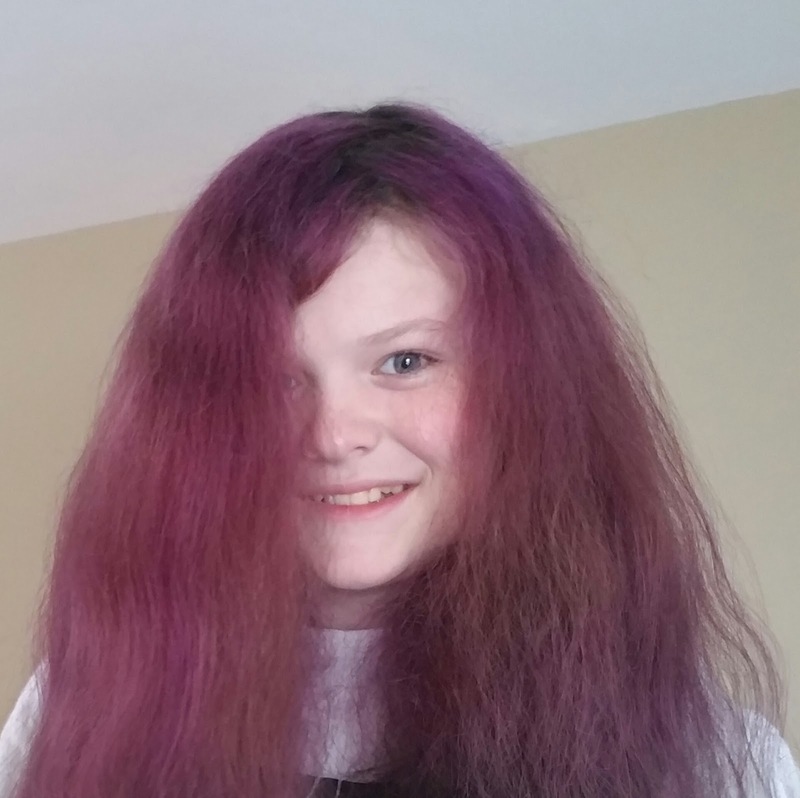 Ari Carroll is an aspiring artist and writer who enjoys writing sci-fi, drawing humanoid cats, and role-playing with friends. Upstairs, artist Yoshiko Moon taught her young students Japanese art including print making, origami, and several different ink techniques. Downstairs, Candice Bryant led kindergarten through third graders in musical theater. 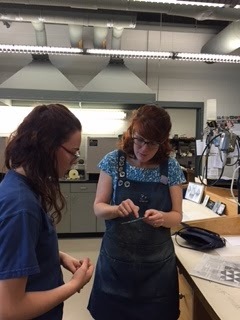 Katy demonstrates an enameling technique. 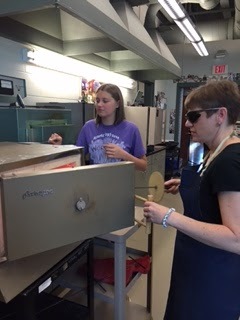 A VERY hot enameling kiln. 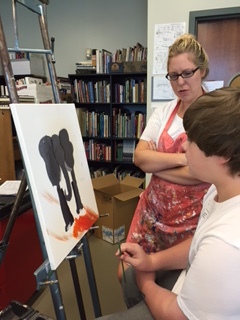 and Amanda Griffith taught animal portrait painting. Coordinating 20 teachers, over 200 students, and 16 high school volunteers, is like juggling balls, rings, clubs, and a few fire sticks. 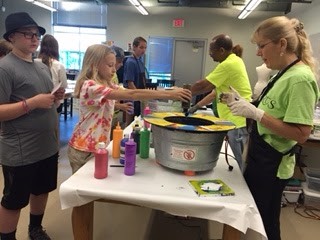 To do that takes someone with a passion for arts education and a love for children. It takes a person like Donna Shank-Major. 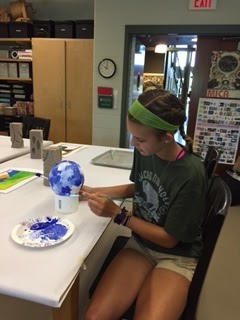 During the academic year Donna teaches design at the Fine Arts Center. But for over 15 years, she has been the juggler making sure that each Explore the Arts student receives a quality experience. 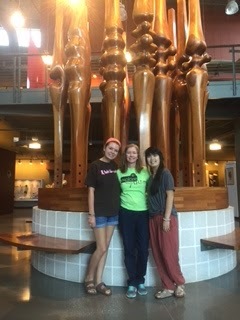 student intern, Bonnie Campbell (right). In 2007 Donna added classes for high school students and the following year opened them to adults. Now teachers can take a class and receive professional development points/hours toward recertification. 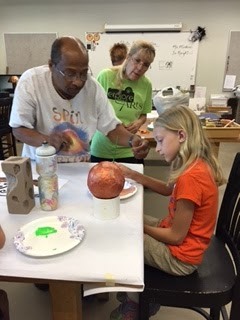 Donna, along with her staff of highly qualified instructors, created an atmosphere of exploration, engagement, and collaboration which stretches and grows each participant. The result is a week of diverse art instruction which parallels Greenville itself: a city with more art, music, and drama than I have time to appreciate. But Explore the Arts was a good beginning.